Antimicrobial peptides (AMPs) are in the focus of scientific research since the 1990s. In most cases, the main aim was laid on the design of AMP to kill bacteria effectively, with particular emphasis on broadband action and independency on antibiotic resistance. However, so far no approved drug on the basis of AMP has entered the market. Our approach of constructing AMP, called synthetic anti-lipopolysaccharide peptides (SALPs), on the basis of inhibiting the inflammatory action of lipopolysaccharide (LPS, endotoxin) from Gram-negative bacteria was focused on the neutralization of the decisive toxins. These are, beside LPS from Gram-negative bacteria, the lipoproteins (LP) from Gram-positive origin. Although some of the SALPs have an antibacterial action, the most important property is the high-affinity binding to LPS and LP, whether as constituent of the bacteria or in free form which prevents the damaging inflammation, that could otherwise lead to life-threatening septic shock. Most importantly, the SALP may inhibit inflammation independently of the resistance status of the bacteria, and so far the repeated use of the peptides apparently does not cause resistance of the attacking pathogens. 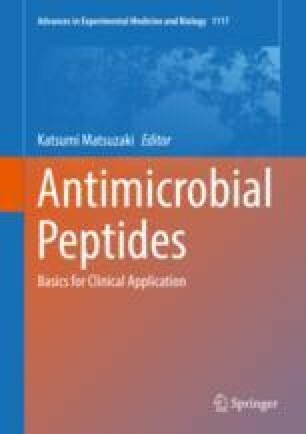 In this chapter, an overview is given over the variety of possible applications in the field of fighting against severe bacterial infections, from the use in systemic infection/inflammation up to various topical applications such as anti-biofilm action and severe skin and soft tissue infections.